Momeson ConviCap: Each capsule contains Mometasone Furoate BP 220 µg inhalation powder. Mometasone Furoate is a corticosteroid demonstrating anti-inflammatory properties. The precise mechanism of corticosteroid's action on asthma is not known. Corticosteroids have been shown to have a wide range of effects on multiple cell types (e.g. mast cells, eosinophils, neutrophils, macrophages, and lymphocytes) and mediators (e.g. histamines, eicosanoids, leukotrienes, and cytokines) involved in inflammation. 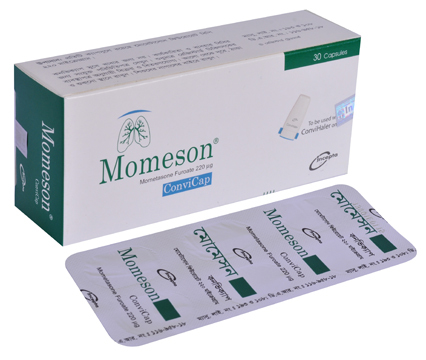 Mometasone Furoate is indicated for the maintenance treatment of asthma as prophylactic therapy in patients 4 years of age and older. It is not indicated for the relief of acute bronchospasm. It is not indicated in children less than 4 years of age. Recommended Dosages in Patients 4 Years of Age and Older. Highest Recommended Daily- 440 µg once daily or 440 µg twice daily. Generally side effects are mild like headache, viral infection, sore throat, nosebleeds and coughing. Systemic and local corticosteroid use may result few side effects like candida infection, immunosuppression, hypercorticism, adrenal suppression, growth effects, glaucoma and cataracts. Use with caution in active or inactive tuberculosis infection, herpes simplex virus infection of the eye, untreated infections affecting the body as a whole etc. Pregnancy: There are no adequate and well-controlled studies in pregnant women. Mometasone Furoate, like other corticosteroids should be used during pregnancy only if the potential benefits justify the potential risk to the fetus. It is not known if Mometasone Furoate is excreted in human milk. Since other corticosteroids are excreted in human milk, caution should be used when Mometasone Furoate is administered to nursing women.